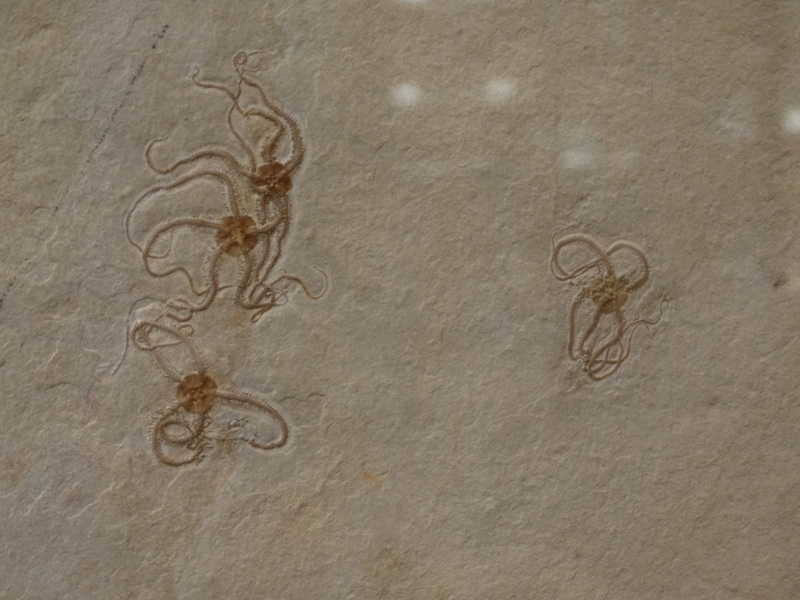 Close-up of brittle stars on a large slab at the museum. The white spots are reflections on the sheet of glass covering the slab. I had two coincidences occur in the winter of 2014, when I met with art historian Bob Herbert, who was conducting research into the 19th century discovery of dinosaur footprints. We were at the art museum on the Mount Holyoke campus to see the gorgeous exhibit of the Ghanaian artist El Anatsui, huge wall hangings from flattened bottle caps, bits of colorfully painted aluminum, copper wire, and other detritus of the modern world of consumption. In another gallery, we passed a landscape by Edward Lear, and I remarked that I’d learned only within the last few years, at a visit to the Mead Art Museum at Amherst College, that Lear was a landscape artist as well as a writer of clever limericks. Bob told me that Lear was better known as an illustrator of nature than as a painter. Later that night, ferreting through old files on my computer, I came across an article saved from the NYT Opinionator column a few years ago, called “The Brittle-Stars Danced. The Stingray Smoked a Pipe,” by Richard Conniff, which starts out with a quote from Lear’s “The Jumblies” and includes one of his illustrations, a lovely picture of a pigeon. The column is devoted to Lear and other Victorian naturalists who wrote nonsense verse and engaged in wordplay. Conniff was drawing a connection between this lighthearted whimsy and the concurrent profound amazement at the discoveries of “new” species all over the world, and how Victorian writers turned this unfolding news into rhymes about fantastical animals and plants. 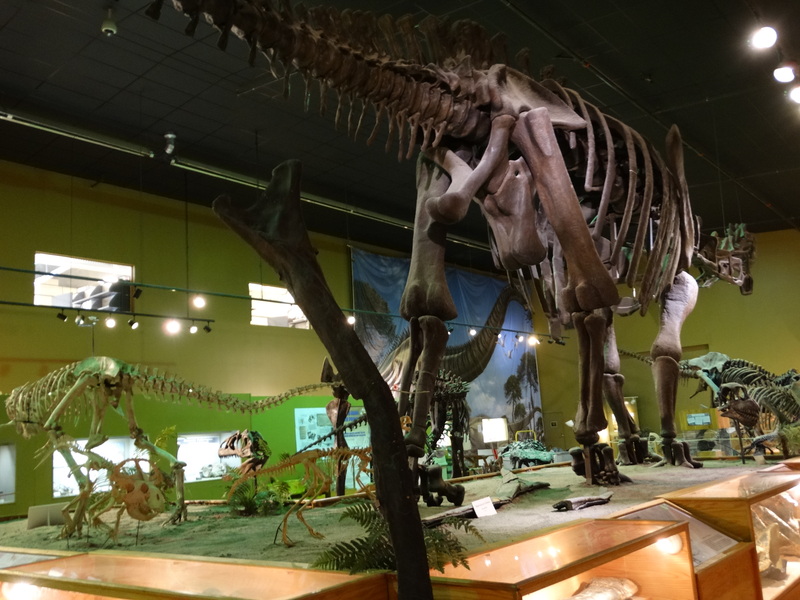 Dinosaur skeleton room at the Wyoming Dinosaur Center in Thermopolis, WY. That’s the first coincidence: Edward Lear appeared in my life twice on the same day. The second is that I have wanted to use a nice photo of brittle stars I took last November at the Wyoming Dinosaur Center, and here was Lear talking about them dancing! The museum looks like an airplane hangar on the outside, but it contains a fascinating and beautifully arranged exhibit of far more than dinosaurs, starting with algal mats. It took us over an hour and a half to get to the dinosaurs, waylaid by stromatolites, ammonites, brachiopods, crinoids, a dunkleosteus, and more. I didn’t know what to say about brittle stars. Saying that they’re cute just doesn’t cut it, and there’s little point in simply picking up information from other web sites that any likely reader can access as easily as I. I now feel not quite so shallow for simply enjoying the aesthetic qualities of these exquisite Jurassic fossils, and they certainly do appear to dance. There are about 20 on the full slab on view at the museum. The label posits that they died en masse in a storm and were quickly buried. Yes, they are informative to paleontologists, and boundless thanks to those people for what they do. I haven’t the patience nor the temperament for it. But the aesthetic quality of any fossil, in this case the brittle star, gives me a jumping-off place, an impetus to learn more. I can search the web to my heart’s content, and some of what I find out may even stick. Stranger things have happened—prehistoric life itself, for one thing. Lear was a contemporary of Edward Hitchcock. I like to think that perhaps the venerable professor read Lear’s silly verses to his children. They all shared a love of nature and words. Hitchcock had a farmboy’s romance with extravagant language, so much so that he could hardly refrain from naming new species, even, as Benjamin Silliman, his friend and mentor at Yale tactfully hinted, when it might be better to wait until he knew a little more before bestowing a name. Posted in Art, Blog, ScienceTagged Edward Hitchcock, Edward Lear, El Anatsui, Jurassic fossils, Richard Coniff, Wyoming Dinosaur CenterBookmark the permalink.